It's time for another Monday morning to be brightened up by upcoming download delights, and this week's European Nintendo Download Update has some promising choices. On the Wii U we have an exclusive from Ronimo Games, a soft and cuddly Good-Feel game and a classic N64 title, while there are also a whole load of discounts and demos to consider. Let's get to the details. 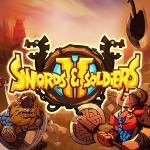 Swords & Soldiers II (Ronimo Games, €18.99 / £16.99) - A Wii U exclusive and sequel to one of the finest Wiiware games, this is a real time strategy game with a side-on 2D perspective. You can play as Vikings, Persians or Demons in local multiplayer, while the meat of the experience is likely to be in the campaign. We anticipate humour and lovely cartoon visuals in this one, too; we'll let you know whether it lives up to its potential in our review. Baila Latino (O2 Games, €29.90 / £24.90) - O2 Games don't have a very good track record on the Wii U eShop, with all their games to date performing horribly in reviews. Let's see how this dance game created with the choreography of professional dancers Carlo Romano and Vera Sokolova, from the prestigious "Carolyn Smith Dance Academy" does in our upcoming review. 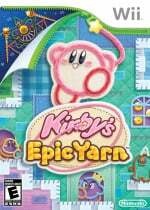 Kirby's Epic Yarn (Nintendo, €14.99 / £13.49 until 28th May, then €19.99 / £17.99) - This was Good-Feel's first dabble in platforming with the yarn effect, taking its idea and applying it to the typically cute Kirby franchise. It proved to be a true gem on the Wii and we're pleased to see it make its way to the eShop; we absolutely loved this in our Kirby's Epic Yarn review. Paper Mario (Nintendo, €9.99 / £8.99) - This is the Nintendo 64 title where Mario's paper-based RPG adventures began. Though it's a relatively linear adventure it's full of wit and innovation, setting up a variety of sequels in the generations to follow. We described this as a "true classic" in our Paper Mario review. I'll be picking up Paper Mario seeing as I"ve had it on Wii VC for ages and still never played it past the first chapter. Great to see Epic Yarn hitting the eShop too! One of the Wii's gems. Paper Mario, seeing as I'll get the discount for having the Wii version. Epic Yarn! Never played it, that's great they are releasing it on eShop. This was one of the game's kinda hard to get for a fair price. Epic Yarn Paper for me. Damn my wallet. Paper Mario all the way! @Desy64 Why? Just don't buy it, d'uh. If I'm not mistaken, Kirby Yarn is the first Wii game that gets released without having been announced a long time beforehand (apart from the first bunch of games, of course). So perhaps we can expect more surprises like that from now on. S&S II is damn expensive. The Wii U sales are great: Thomas was Alone, Lone Survivor. Time to get them! I'll have some Kirby this week. I'll be getting Thomas Was Alone on sale. Also, I doubt the Codename: STEAM Theme is free, is it? It's not like Nintendo to give away free themes. Damn, the 3DS is truly dead. I played through Epic Yarn last year on my Wii and loved it but not interested in playing it again,at least for now.Paper Mario has never really appealed to me for some reason,maybe I should try this one?Really enjoyed Swords and Soldiers but the price seems a bit steep for what it is,i'll wait on reviews for that.I'll definitely be taking advantage of the Curve 50% sale though.I meant to get them all last time they were on sale and never,glad I waited. Cool, Nintendo decided to release Epic Yarn to hype people up for Woolly World! I'll be getting that and Paper Mario. Ah, swords and soldiers 2 of course! But the discounts are great this time. I’ll pick up the swapper and stealth inc just to play later on. I don't own one so it doesn't bother me but surely this has to be one of the worst 3DS weeks there has been?Even the barely discounted games are a poor selection. True. I just need one more; Megaman & Bass and it's complete. @RainbowGazelle Why not? I got the SM3DW and the Sonic one for free, plus there was a Halloween one they sent me a free code for, but never used. Sonic isn't Nintendo, and I was unaware there was a SM3DW theme. @RainbowGazelle The Cat Mario show theme. "Swords & Soldiers II" for me, loved the original. Sigh...we're still waiting for more Wii games for the Wii U here in North America. We haven't received any since January, make it happen Nintendo! I think I'll be getting Paper Mario, if anything. Also, funny how CIRCLE released demo for Adventure Bar Story this late when the full game came out a while ago. But at least it's good for anyone who's on the fence about buying it, I personally highly recommend the game! I wonder is the Cave Story 3D ever going to get released in the eShop? Rodriguez was teasing about that like a year ago? Renegade Kid and Nicalis are still lacking in releases in Europe. Wait, the Code Name S.T.E.A.M. theme is free anyway? Paper Mario for me. Love that game. I will upgrade Paper Mario right away, and probably get Swords & Soldiers II later. I still have the first one to beat. Looking for to the Baila Latino review..
Kind of crazy on my part considering how many games I have on my backlog, but I might get Conception II. Not sure yet, however. @Neko_Rukiafan It's a shame NoA has had a larger focus towards garbage VC games. NA are still waiting even for very important GBA games like Sacred Stones, Zero Mission and the 2nd half of Golden Sun. With Paper Mario, The Witcher 3, & Life Is Strange chapter 3, this week is going to be fantastarific!!! Only Paper Mario (as an upgrade) for me, if even that. If you don't already own Epic Yarn, GET IT! Such a fun game, and for an awesome price. Alright we finally get Paper Mario. Not that I'm buying it (have it on Wii VC and finished it - not looking to replay it) I'm just glad we might get some surprise new N64 games now. Tempted to get Epic Yarn though. Was thinking about picking up Thomas Was Alone, so will definitely take advantage of the sale price! Please please please come to North America Kirby Epic Yarn! Also Donkey Kong Country Returns and that other Kirby Wii game. I haven't played Epic Yarn or Donkey Kong Return. It'd be great to get to play them on my Wii U. @Neko_Rukiafan this. I don't understand why Nintendo cannot release these Wii VC games worldwide. I have been waiting for Kirbys RTDL since it was available in Europe. I ended up buying a physical copy on craigslist. I prefer physical so that worked out well. But it was also lost $ for Nintendo. @PrincePeach92 you should be able to find Epic Yarn pretty cheap. Donkey Kong Country Returns Wii is a great game but if you have the opportunity, get Tropical Freeze. It surpasses the Wii game in every way. Both Paper Mario and Epic Yarn for me!! Waiting for a review on S&S2 to see if there's any real justification for the price doubling from the Wiiware version (in the US $9.99 - $19.99) other than, Affordable Space Adventures did it, so we can too. They've already worked in HD many years ago on PS3 so that cant be it. Maybe if Splatoon was $40 like the rest of the world I could still pick this up for $20, but there's only so much gsme money to go around. And I spent $4.80 on the Mass Effect Trilogy this weekend on PSN, thats only $1.60 per game but those 3 games will take me awhile to play. My birthday gift offer still stands. Need to get DK 64 and Splatoon is close so I dont mind if this week is bad. Swords and soldiers n paper Mario for me defo.may get epic yarn though I'm aiming to get rainbow paintbrush this week first.ive got all the curve games but I've heard good things about master reboot and shiny the firefly has a megadrivey vibe so i may end up with quite a lot haha. Any information about the version of Paper Mario in Europe ? European modified to fit NTSC speed ? Or is it the NTSC 60Hz version ? @shigulicious I already have Tropical Freeze. That game is so good. It's difficult and I still haven't been able to finish it but I love it. (Can't get past that water world lol) I saw gameplay vids of DKCR and it looked really fun also. Ever since I got the Wii U I prefer buying Digital Games. There's something about having them all in the system that I love. Already got a physical copy of Yarn, and Paper Mario on Wii VC. Apart from free demos (which I've got a huge backlog of) there's nothing for me this week. Happy to wait for Splatoon next week anyway, can't wait! That's a poor selection for the 3ds this week. Woah, when I thought its virtually impossible to offer any worse titles for the 3DS ... look at this week. Is it possible to show any different that Nintendo doesnt care about the 3DS anymore? You can bundle all of that into a 500 stars download package. By offering this stuff, Nintendo should also allow an option to WITHDRAW money from the Eshop because no way i will spend a cent on any of that crap, now or in the future. sigh Meanwhile in North America, we haven't got a new downloadable Wii game since January. Swords and Soldiers 2 is a nice looking game but like with so many other weeks the Wii U VC and eShop releases just don't really excite, the variety and choice just isn't there like it was with Wii VC. The lack of third party games, consoles and arcade classics just narrows the choice of games to the point of there being no real suspense at what's going to be released, it's clear now that a certain library of games is being offered and that's it. @crimsontadpoles Selection? There is no selection. Being that the original Wii VC was like a one stop shop for retro gamers it was thought that Wii U would improve on this service and really expand the retro experience but for the most part disappointingly that just hasn't been the case. Nintendo are understandably going to put there own games and systems first but to be so rigid about it to the point that it basically shuts the door on many great games coming to the Wii U VC is frustrating. Nintendo do so many things well so hopefully this might change with the release of the NX console.. I never did try Epic Yarn, but it seems like a nice neighbour for Wooly World so I have to take advantage of the sale. Paper Mario and Swords and Soldiers II are also on the list. And then there's Splatoon next week! Too many games! Does olliolli still have cross buy I'd prefare it on 3DS. I hope Epic Yarn comes to NA soon! Love that game! @sinalefa - Maybe I'll let my kids buy it for me for my birthday, they always have eShop cards laying around they could re-gift to me. My wife is probably getting me Godzilla on PS3. Course it's digital only but maybe she can pick me up a couple of PSN $20 cards? Paper Mario is out! I'll probably get it due to the Wii-related discount. Next week we'll see the next retro game that'll flood the comments' section! Are you telling me the Godzilla game on PS3 is downloadable only? @Game-Over I think it's more the third parties refusing to put their consoles onto the Wii U VC. The main one, SEGA said a while back that they weren't at all interested in putting Genesis, Master System, Dreamcast, etc. on Wii U VC. Don't count on it, We still don't have Donkey Kong Returns or Pandora's Tower. @ikki5 Or Sin and Punishment. Grumblevolcano...That could be true, maybe it is out of Nintendo's control but the Wii U is a very all things Nintendo console this time around. There just isn't the same kind of overall choice that was there with the original Wii, regardless of the lack of consoles there's no real arcade games coming either. The Virtual arcade has been forgotten, i thought with the more powerful Wii U this was something they would really expand on but they have pretty much given up on it. @sinalefa - "Godzilla game on PS3 is downloadable only"
Well it is in the US. Japan and EU/UK get the disc version. Thanks. Then I guess MKX will be the only new PS3 game I get this year. Nintendo have done a good job of making a large part of there archive of games and systems available on the Wii U but it's unfair that they have quietly chosen to pretty much ignore 3rd party classics this time around. It surprises me that more people don't have an issue with this, most people must have more then one console. japan gets the good stuff, europe gets crap, and america gets nothing. Yarn, wool, paper, clay,... And soon one hell of an ink-fest. All we need now is Okami U. If Conception II drops down to 14.99 in North America this week I just might pick that up. Ooh the Swapper. I know I got it free on PS plus but I don't think I'll resubscribe any time soon. Anyone who hasn't tried The Swapper yet, please do...It's beautiful. The atmosphere is dripping, the puzzles are tricky and the story? Well thought out. This is coming from someone who's not finished it yet, and avoiding of spoilers - sooo I like ! The track in 'recreation' still plays in my head. Do I need a wii mote to play kirby epic yarn? Swords & Soldiers II is expensive but I am sure it is worth every cent. I play the original to this day. Can't wait for it to come to NA later this week. Day 1 purchase with no regrets. 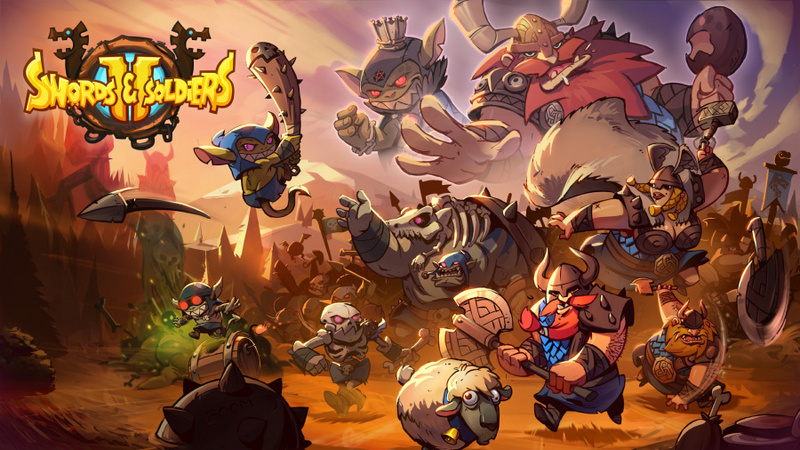 Swords and soldiers is far to expensive for an game with a mobile gameplay style. The first struggled to sell until it was £3 so why they think £17 is the next correct entry point ? Kirby's Epic Yarn is amazing and I'm glad it's found a home on Wii U. Never played Paper Mario... tempting, but it's not in a sale, so no. Only thing this week for me is the free HOME theme. Nintendo's game page for Epic Yarn (http://www.nintendo.co.uk/Games/Wii/Kirby-s-Epic-Yarn-281617.html) lists the GamePad as a compatible controller. I'm not sure how since parts of the game require pointer input from the Wii Remote, but if it does work I may just double dip since I hate switching into Wii mode for my Wii discs. And as I thought, the Home Theme isn't free.